02/20/2010: "Bakfiets Road Test Coming Soon"
Those frames had glass, and the roads here are bumpy, but (with the help of some old towels for padding) the Cabby carried them safely home. 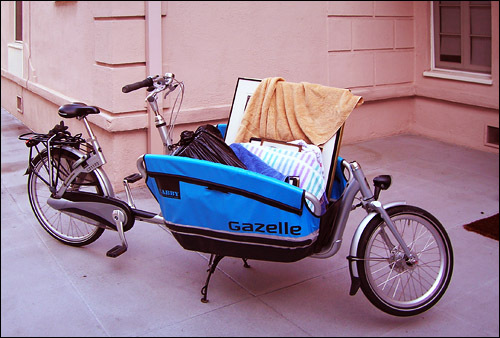 While by no means a zippy bike, it's remarkably easy to handle even loaded up. Keep your eye on this blog for an announcement of the full report, once we've put the thing through its paces.